Whenever I visit Dallas, I try to stay downtown in the West End so that I can walk around and explore some of the interesting areas there, such as the JFK Memorial at Dealey Plaza, the Old Red Courthouse and things like that. I was walking in that area on my last visit when I looked up and caught this sight. 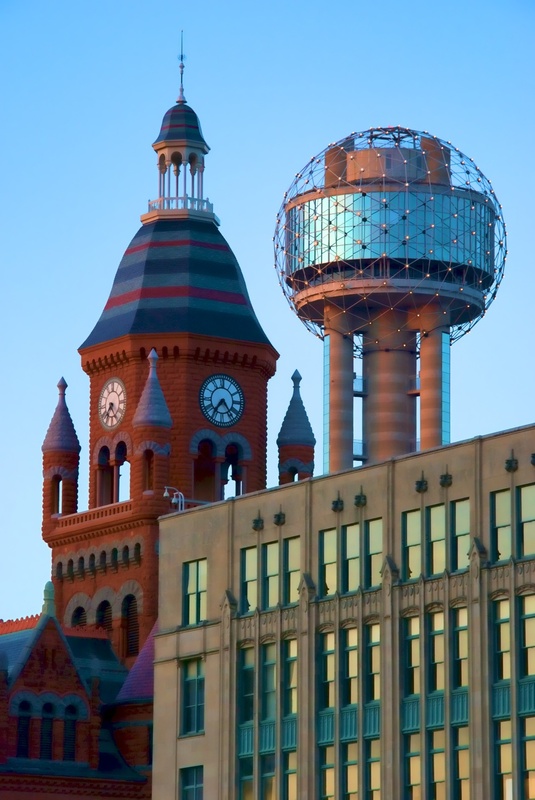 I was attracted to the collision of architectural styles presented here - the classic, subdued look of the building in the foreground; the Romanesque style, ornate design elements and bold colors of the Old Red Courthouse; and the futuristic look of the Reunion Tower rising in the background. Perhaps it's symbolic that the futuristic one is rising and towering over the others? Who knows - I just liked the contrasting styles.